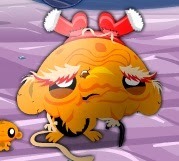 Monkey Go Happy: Xmas Time is an interesting adventure game. You have to help monkey in finding gift boxes to present it to other little monkeys. Explore each part of the place and grab the item, solve puzzles and complete the game. Good luck!